A recent letter to the editor written by Jon Turner to the Des Moines Register in favor of the MLK extension project falls prey to several commonly-held transportation myths. I want to debunk these myths here. Come to my Beaverdale neighborhood anytime during peak travel hours and try to cross Beaver Avenue at an intersection that does not have crossing lights. Traffic control and traffic volume are NOT the same thing. The letter to the editor makes this common error of assuming that reducing traffic volume is the only way to make a street easier to navigate at rush hour. 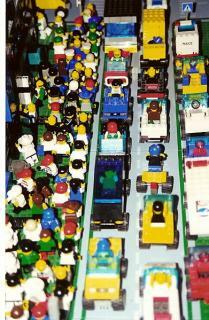 In fact, controlling traffic flow is actually easier than controlling traffic volume - one can plan a control strategy. Volume is a function of a variety of factors, most of which are outside the realm of direct control. What the author can control is his own travel path during known times of heavy traffic. Adding streets and Interstate connections will NOT reduce overall traffic. It is a commonly known, though not commonly acknowledged, fact that new and widened streets do not reduce congestion. Ironically, they increase congestion due to increasing the total vehicle miles traveled. Until we rethink our underlying transportation system and subsidies for single-occupancy vehicle travel, road additions and widening will remain a game of catch-up. Let's reduce the number of vehicles speeding through my residential area trying to beat the flow out of town every night. The author bases his entire argument on the fundamentally flawed assumption that a connector from Downtown through I-80 will reduce traffic through Beaverdale - a neighborhood several miles west of downtown, with no direct street connection. It is just too big a leap to assume that any measurable amount of Beaverdale's through-traffic is people trying to save time by cutting through 6 miles of local streets to get to the northwestern suburbs. The last time I checked, not one single person lives in the pathway of the proposed extension north of Euclid Avenue. There are two separate sections of the proposed extension. One section cuts through a protected wetland. The other cuts through an established neighborhood. The author minimizes the impact on the wetlands area (not my area of expertise) and ignores the impact on the actual residential neighborhoods affected by the expansion (my area of expertise). While there may be valid arguments in favor of the extension, I have yet to hear any that positively and demonstrably benefit the City of Des Moines. The Des Moines Register recently published an editorial in part promoting the extension of Martin Luther King drive through a new I-80 interchange to Ankeny. In response, Michael Baldus of the Neighborhood and Natural Recreation Protection Project (NNRP.org) wrote a guest column that was published today.